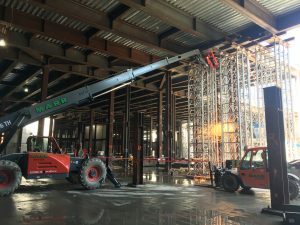 In December 2016, Marr Scaffolding Company’s shoring division began work for JDC Demolition at the site of Harvard’s Science and Engineering Complex (SEC) in Allston, Mass. Marr spent over seven months installing more than 100 shoring towers throughout the site. To learn more about the project, click here to read our latest article in the August issue of High Profile.